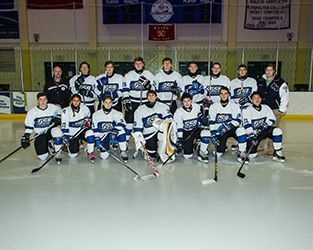 This winter's varsity ice hockey roster included only 15 players, a small crew that held together over the course of 20 games and scrimmages. Each member of the team garnered considerable ice-time and underclassmen gained valuable playing experience for next year. While several of the players showcased talent on the ice and all played hard, the size of the roster made it tough to complete against larger programs. Throughout the season, the team started games strong, but as the minutes wore on, the squad struggled to keep opponents off the boards. Highlights from the season include the phenomenal work of Grayson Valentine '17 and Mark Lewis '19 to defend the net. The two combined for just under 600 saves this season. In a December matchup against Newton-Lenape Valley, Grayson Valentine posted 47 saves on 55 attempts, a season high for him. Later in the season, the talented freshman Lewis managed 57 saves on 65 attempts in a game against Vernon High. Next season, the team will rely on both keepers for strong defense. Leading the scoring this season was sophomore Ryan Turse with 10 goals and six assists. Turse managed a hat trick in a January matchup against Edison High and then went on to to enjoy a four-goal game later in the month against West Orange High. Following Turse in scoring is Nate Crystal '17, who posted seven goals and six assists, including a season-ending hat-trick against Bayonne. Other important offensive contributions, in the form of goals and assists, came from this year's seniors: Ryan Chestnutt, Gavin Ferruggia, George Harris and Patrick Janas. Next season, the team will look to lead scorers on the junior lineup, Nate Crystal and Christian Germaine and to continued contributions from Nathaniel Bess, Isaac Ling, Jen Lowe and Graham Valentine. Sophomore Tyler Schrecengost and freshman AJ Donofrio, both of whom contributed goals and assists this year, will also be expected to play increasingly important roles next season.